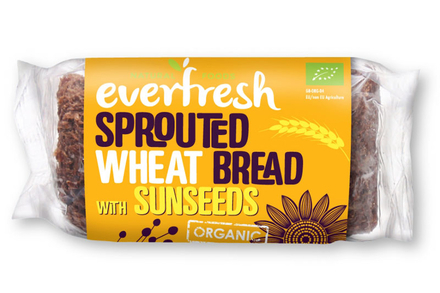 Sprouted Wheat Bread with Sunseeds, Organic 400g (Everfresh Natural Foods) - HealthySupplies.co.uk. Buy Online. Delicious and healthy alternative to processed white bread. Made using sprouted whole wheat, sunflower and flax seeds. Sprouting releases the goodness stored in a grain and converts many of the complex nutrients into much simpler forms that are then more easily absorbed by the body. Suitable for a low GI diet. No added sugar, fat, salt, egg, yeast or dairy. Sprouted whole wheat (90%), flax seed (5%), sunflower seeds (5%).